Jackets for kids excel just as much as their counterparts for adults concerning quality and processing or warming ability. After all, it is important, if not even more important, for kids to be perfectly protected in wind and weather. Whether it is a rain jacket for kids, a winter jacket for kids, a down jacket for kids or a hardshell jacket: What's good for the big ones, will keep the little ones warm, too. With the right jacket for kids nothing can stop the outdoor fun! Which jacket for kids is the right one? Jackets for kids have to be simple, tough and warm in the first place. There are suitable jackets for kids for any occasion and any weather. Because of this the number of products on offer is very large. If you know for which purpose you need a jacket, you will now exactly what you need to pick for your kids. The fleece jacket is a cuddly and lightweight jacket for kids. Fleece has excellent insulation abilities and keeps the little outdoor friends warm on any occasion. 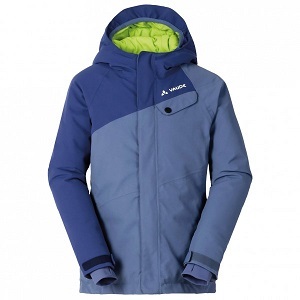 It is perfect for the transitional seasons or as an additional insulation layer underneath other jackets for kids. If the weather is really messy, your best pick is a hardshell jacket for kids. The hardshell jacket is absolutely wind and waterproof and keeps the little ones pleasantly dry even in heavy rain. While romping about the breathable membrane ensures a proper moisture management and prevents the body from overheating. Bad weather, bring it on! Jackets for kids for the cold time of the year. The winter jacket for kids is perfect for freezing temperatures. Keep your cool in winter with waterproof and tear-resistant outer materials and fluffy warm linings on the inside. However, the prize for best thermal output among winter jackets for kids goes to the down jacket, hands down. Down is still on top of the list when it comes to the insulation ability of linings. That way, freezing temperatures are no match for the little outdoor guys. With warm, tough and comfortable jackets for kids, the little ones are excellently prepared for any type of weather. Whether they are out in the nature, hiking, climbing playing or in school - warm jackets for kids offer the best weather protection at all times. So let them speed out the door, no matter the weather!